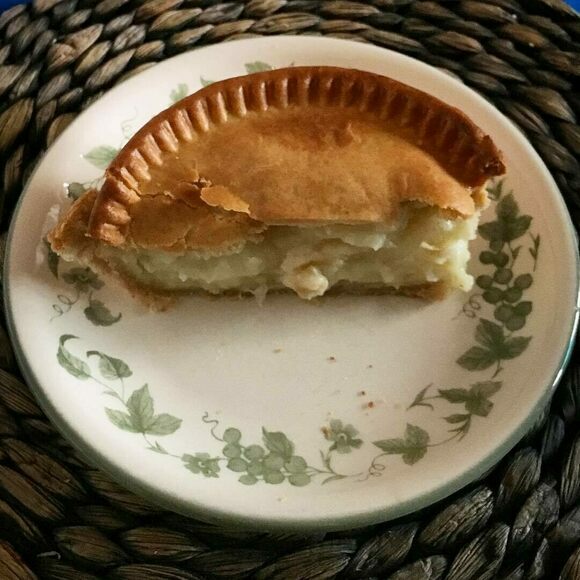 This shortcut pastry pie contains only potatoes, onions, flour, salt and pepper, and loads of butter. Often, bakers use lard in the crust, making it non-vegetarian. The dish is popular throughout Lancashire, but very much so around Preston, which has a large Catholic population (it used to be commonly referred to as “Priest Town”). As Catholics were not allowed to eat meat on Fridays, butter pie was developed from local meat-and-potato pie recipes, replacing the meat with butter. Also known as Friday Pie or Catholic Pie, it provided an alternative Friday lunchtime dish for Catholic manual workers who needed a large daily input of calories. The butter provides a richness to the hearty dish, with the onions and seasoning providing the main source of flavor.